Liveaboards in Similan Islands will take divers to the most well known dive areas in the amazing dive destination of Thailand. The Similan Islands are ranked as one of the top dive destinations in the world. Made up of 9 granite islands, located 100 km Northwest of Phuket and 65km offshore from Phang Nga Province in the Andaman Sea, the Similan Islands were declared a National Park in 1982 and offer scuba divers exceptional diving adventures. 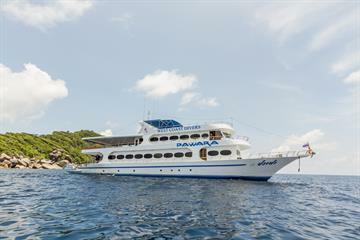 Similan Island liveaboards will visit dive sites that feature varied landscapes and vibrant marine life. Massive boulders, caves, reefs and passages are home to over 500 species of hard and soft corals and astonishing pelagic life. The East Coast boasts exceptional visibility and weak to moderate currents while the West Coast waters are deeper with stronger currents. 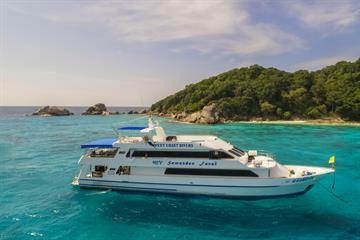 With such varied dive sites, the best way to enjoy the Similan Islands is on a premier dive liveaboard. The landscape of the Similan Islands are a feast for the eyes both above and underwater. From the tropical white sandy beaches and clear blue waters to the granite boulders on land and underwater, it is a paradise difficult to surpass and understandably one of the most popular dive locations in the world. 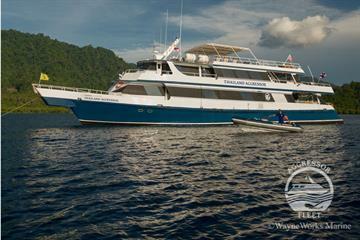 It is becoming ever more popular to take a dive safari on a liveaboard due to easy access to these remote islands. An abundant marine life roams the subterranean landscape of these islands. It is common to see leopard sharks, guitar rays, whitetip sharks, blue spotted stingrays, clown triggerfish, rabbit fish, scorpion fish, snappers, emperor fish, giant trevally and angelfish. Turtles and giant bumphead parrotfish make their appearances and the sharp eyed diver may find tiny ghost pipefish, mantis shrimps, porcelain crabs or cleaner shrimp. To dive amongst the boulder formations and see their impressive size underwater is truly wondrous. Anita's Reef on the east coast, just off Similan Island No.4 boasts impressive coral formations, boulders this subterranean landscape provides a sanctuary for a very diverse marine life. From hunting Bluefin trevally, yellowfin goatfish, blue damsels to the very common shrimp gobies, the easy currents allow for a great first dive option for most dive trips. 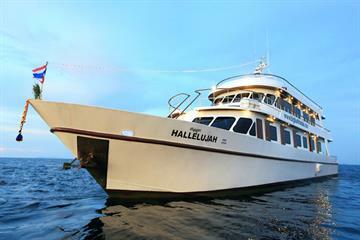 West of Eden, also known as West of Six for its location to the north-west corner of Island number 6, enjoys a healthy hard coral reef and massive granite boulders. Batfish, Turtles and Octopus are common residents to the reef. Through the rocky channels, frogfish, ribbon eels, giant morays and barracudas can also be seen. Keep an eye out in the blue for passing larger pelagics. Elephant Head Rock, named after a rock that jets out of the water visible from the surface, this is the biggest pinnacle in the Similans and has some fantastic swim-throughs. A more challenging dive site due to strong currents, you may see white tip reef sharks, batfish, trevally and barracuda can often be seen on the perimeter of the boulders and the avid macro photographer can look out for smashing mantis shrimp, fire gobies, porcelain crabs and cleaner shrimps. Boulder City, is a large submerged granite outcropping, about 1km off the east coast of island no.3 with jumbles of boulders scattered around a flat sandy bottom. A slightly more advanced dive site, the current can sometimes bring the whale sharks and manta rays. Shark Fin Reef - As is prevalent in the Similans, this dive site consists of another series of granite boulders covered in gorgonians and hard corals with a great diversity of marine life including the Napoleon wrasse, turtles, boxfish, clown triggerfish, schools of batfish, yellow goatfish, palette surgeonfish, blue-faced angelfish and bannerfish amongst others. Honeymoon Bay lies to the northwest of Island 5. Its sheltered location, it is a popular place for boats to moor and include a night dive. This is when the Reef crabs, shrimps, lobsters, cuttlefish and nurse sharks all come out, leaving their crevices looking for food. With an average depth of 15-20 meters, the reef is decorated with hard corals, keep an eye out for shy garden eels on the sandy bottom. Christmas Point, true to its name, is one of the most colourful, scenic dives in the islands on the far west side of Similan Island 9. This outcropping is home to several giant archways which provide superb topography and forms some of the best swim-throughs in the Similans. Other dive sites include: Three Trees, Beacon Point, Breakfast Bend, Chinese Wall, Coral Reef, Deep Six, Hideaway, Deep six, North Point and Stonehenge. 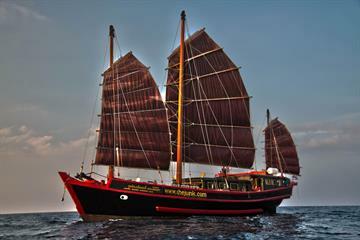 Thailand liveaboard trips to the Similan Islands run from November through to May. The Islands are closed for the rest of the year. The end of February often sees an increase in currents attracting the larger marine creatures like whale sharks and manta rays. Visibility ranges from 25-40m during this period and water temperatures range between 26-29c. You may not need more than a 3mm neoprene shorty or full body wetsuit bearing in mind after a 3 or more dives a day, you may get cold. If you are bringing your own equipment, consider bringing a DIN adapter (if you have DIN regulators) as Thailand uses the standard yoke system. Please check your individual liveaboard itinerary carefully and be aware of different departure ports depending on your liveaboard chosen. 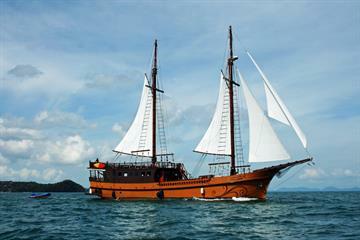 Liveaboard cruises may depart from Chalong Pier in Phuket, Thap Lamu Pier in Khao Lak, Phang-Nga Province. Transfers to the port are provided from Phuket International Airport or your hotel. Please notice some liveaboards may even depart from one port and return to another, i.e depart from Phuket and return to Khao Lak. Some International flights fly directly to Phuket or you can get a connecting flight from Bangkok.